The bright sun a searing heat against her bare shoulders, the scorching pain trivial against her shattered heart as she watched them lower the coffin. Her memories all that remained as she bade her final farewell, words left unspoken, willing her to hear them wherever she now may be. Only last month they had sat together at her vanity with its tarnished scalloped edged mirror; their reflections staring back happily as they talked of times now lost. The young girl watched herself with an older woman, her dark brown locks against pure white. The older woman glimpsed a young girl, a silhouette of her soldier standing tall behind her his hand resting lightly upon her shoulder. 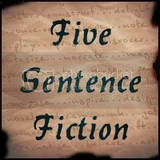 Linking up with Lillie again this week for Five Sentence Fiction. THIS piece was difficult. The original picture shared with the prompt set me off on a tangent (the old seeing themselves as they once were) but then the ghostly apparition appeared in my words almost like a a premonition to the beginning of the piece and that's why I feel it might be a little back to front. I don't know - what do you think? Perhaps I'm over thinking it a little as this started out as a memory of my late Nan and is a creative take on a conversation we once had. I thought it worked beautifully. Well done. Beautiful Car, evocotive and heartwarming rather than sad as it might have been. It didn't feel back to front to me although I can see that it would have worked either way round. A beautifully told story in just five sentences. Well done. I enjoyed your take on it and you conjured up some lovely images of the past amongst the living! That's a truly powerful image you created so vividly! Beautiful job! !